At Capitol Dentistry in Toronto, we invest in dental technology for the convenience of our patients. 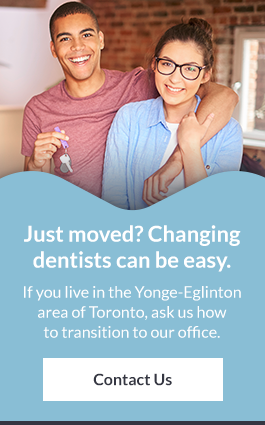 Learn more about the technologies available at our Yonge and Eglinton dentist office. Oral cancer screening (OCS) may be the best way to detect oral cancer early, and our dental hygienists play an integral role in early detection. Detecting the disease early is key! Your hygienist will perform a thorough visual examination of your mouth, head and neck to check for any abnormalities. Extra-oral Examination: A visual examination of the head, face, front and back of the neck, including behind eyeglasses and under the hairline and ears. Intra-oral Examination: A visual check for anything unusual in the mouth including swelling, enlarged or swollen salivary glands, indentations, ulcer/crusting, symmetry and any changes in texture or colour such as white, red or mixed red and white patches or lesions. Oral Screening Technologies: VELscope screening technology designed for patients who would like a more thorough examination of their oral cancer risk. We have technology called digital radiography to support the diganosis and treatment of our patients. Digital X-rays help our dentists see issues with your oral health that may not be visible from an oral inspection. As well, we are able to access files fast, so you don't spend extra time waiting for film to develop. We use the Picasso by AMD Laser to treat gum disease, re-contour gums, remove lesions, perform biopsies, help eliminate infection and more. Our dental professionals use the Picasso by AMD Laser to treat a variety of dental concerns – gum disease, gum re-contouring, removal of lesions, perform biopsies, help eliminate infection and more. Kavo Diagnodent is a technology that allows dentists to detect cavities without the use of X-rays. The dental cone beam CT (computed tomography) is a type of x-ray that is used when regular x-rays are not sufficient. Your dentist may use these to produce 3D images for dental implant planning. The iTero Scanner is used by your dentist to create digital impressions of your teeth. iTero technology is used for your Invisalign treatment to assist your dentist in your treatment planning.